Talk about one giant leap for mankind! Few people know it, but the first man in space wasn't an astronaut. It was test pilot Joe Kittinger. In 1960, the little-known pioneer was part of an U.S. Air Force project called Excelsior, which was designed to test the effects of space on human beings — and, more important, to determine whether an astronaut could survive an aborted mission, even at 20 miles above the earth. Kittinger had the right stuff. He traveled all the way into space via balloon — then jumped out. "I turned over and I looked, and I could see the balloon flying into space. And then I realized the balloon was standing still and that was me that was flying straight down. Going very fast!" Kittinger told The Early Show co-anchor Harry Smith. What was his last thought before he leaped? 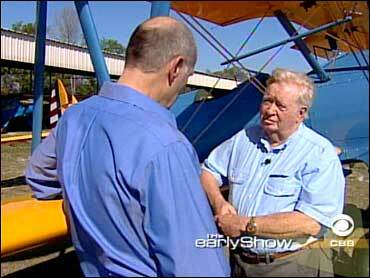 "Well," Kittinger said, "I just said a prayer. I said: 'Lord, take care of me now.' It was the most fervent prayer I ever said in my life." Kittinger's historic leaps were big news back in 1960. Life magazine did a huge spread. But Kittinger's death-defying acts soon were eclipsed by rocket-propelled space flight. He quickly became a footnote in the space race. "Remember," Kittinger pointed out. "We didn't have the PR that NASA had." A trained fighter and test pilot, Kittinger later volunteered for combat missions in Vietnam. He flew a mind-boggling 483 combat missions during three tours. On that 483rd mission, flying at twice the speed of sound, "The world's greatest fighter pilot on the other side shot me down … and I ejected at Mach-1, at about 18,000 feet," he said. "I landed and was immediately captured, and I spent the next 11 months at the 'Hanoi Hilton,'" the infamous torture chamber that housed dozens of American POWs, including Sen. John McCain. After retiring from the Air Force, Kittinger went back to flying balloons. In 1984, he became the first person to fly a balloon solo across the Atlantic, going from Maine to Italy in 83 hours and setting four world records in the process. French adventurer and retired paratrooper Michel Fournier is trying to break Kittinger's longstanding record for heights from which someone fell safely to Earth. He's been preparing for 20 years. Two other jumpers have died trying to break Kittinger's record. Some people think Fournier is crazy. He sold everything he owns and spent $10 million — and has failed twice. While Kittinger's record is important, Fournier also wants to prove something: that an escape system on the space shuttle would have been able to save the lives of the Columbia astronauts. Says Fournier, "When you present the project and present the scientific aspect, that this project is for the rescue of astronauts, we start to see, 'OK, this project is not that crazy. It's doable, and Joe Kittinger did it.'" Kittinger has been waiting for someone to break his record. "I really thought that somebody would go higher than that pretty soon," he said with a chuckle. "It's been 46 years. It's not easy to do." For complete details about Fournier's project, click here.